Andrea di Pietro della Gondola was born in Padua in 1508; his parents were Pietro della Gondola, a miller, and Marta (called “la zota”). It was in Padua that Andrea completed his first experience as a stonemason in the workshop of Bartolomeo Cavazza from Sossano, who is said to have subjected him to hard working conditions. In fact, after a first failed attempt, he escaped to Vicenza in 1524: he joined the workshop of Pedemuro San Biagio, run by Giovanni di Giacomo da Porlezza and Girolamo Pittoni da Lumignano, two sculptors who were really famous in Vicenza at that time. 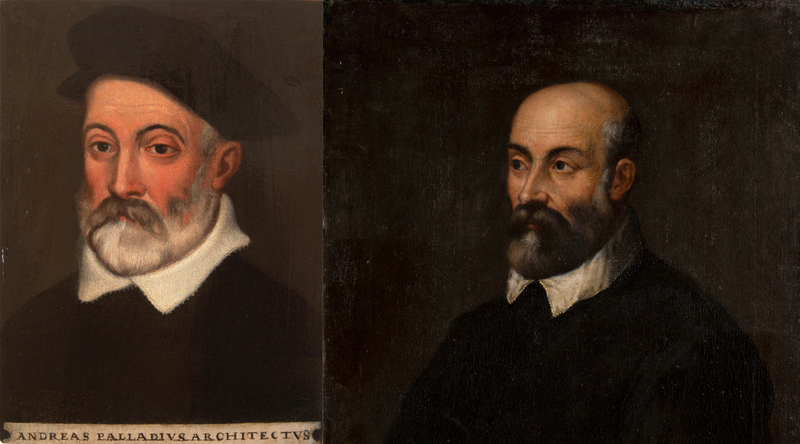 The key moment that would change Palladio’s life was the chance meeting with the humanist poet Giangiorgio Trissino, who hired him for the reconstruction of Villa Cricoli between 1535 and 1538. Trissino took interest in his work, gave him the name “Palladio”, helped him in his cultural formation (based mostly on the study of classic literature and art) and granted him the opportunity to visit Rome. It was in this city that Palladio saw for the first time those architectures he had learnt to love – he had the chance to examine the imperial monuments, by admiring their beauty and by studying their materials, their construction techniques and their spatial relations. By travelling with Giangiorgio Trissino, Palladio also got the opportunity to meet the greatest artists of that period, such as Michelangelo, Sebastiano Serlio, Giulio Romano and Bramante. He began in 1540 his self-employed activity as an architect and he designed buildings such as Palazzo Civena next to Ponte Furo (in Vicenza) and Villa Godi in Lonedo. However, what made him famous in 1549 was his design for the loggias of the town hall of Vicenza (known as Basilica Palladiana) which were to replace those built in the fifteenth century. His project got the better of fierce competitors such as Serlio, Sansovino, Sanmicheli, and Giulio Romano. Since then, all the noble families of Vicenza and Venezia competed for his work, thus marking the beginning of a period of intense activity for Palladio. This led to the construction of marvellous buildings such as Palazzo Chiericati, Villa Barbaro di Maser, the “Malcontenta” in Mira, the venetian churches of Redentore and S. Giorgio Maggiore and the famous Villa Rotonda. Moreover, Palladio published in 1570 “The Four Books of Architecture”, a treatise influenced by his culture, his ideals and his concrete experience. Later, he worked in Venice as a “proto” (that is, an architectural consultant for the Serenissima) between 1570 and 1580. In 1580 Palladio began the construction of the world-famous Teatro Olimpico, a theatre commissioned by the Olympic Academy (of which Palladio himself had been one of the founders in 1556) which would be used for classical tragedy. However, this theatre was not completed until after Palladio’s death, which occurred on the 19th of August 1580.